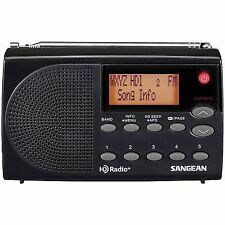 Sangean HDR-14 HD AM/FM Pocket Radio 7.40in. x 7.10in. x 2.50in. CHECK PICTURES FOR MORE INFORMATION. CHECK PICTURES FOR REFERENCE. Check pictures for reference. As you can see from actual picture,( What you see Exactly what you get ). UP FOR SALE IS A New Original Sangean ANT-60 AM Short Wave Portable Antenna LOOK. CHECK PICTURES FOR MORE INFORMATION. CHECK PICTURES FOR REFERENCE. As you can see from actual picture,( What you see Exactly what you get ). UP FOR SALE IS A Sangean Internet Radio WFR-20 with remote LOOK. CHECK PICTURES FOR MORE INFORMATION. CHECK PICTURES FOR REFERENCE. TESTED FOR KEY FUNCTIONS. As you can see from actual picture,( What you see Exactly what you get ). 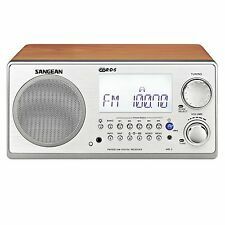 This Sangean PR-D7 AM/FM Digital Radio is in very good condition. The case has yellowed a bit due to age. AM and FM work well with the power adapter or batteries. I have never used the charging feature. Used - Tested & Working. ITEM HAS BEEN TESTED AND IS WORKING GREAT. No other accessories are included in this sale. Maker Marks: Sangean RDS ATS-909X. Batteries were put in and unit powered on, but no further testing was done. Case has scuffs and signs of wear. Colors: Black. Sangean Pillow Speaker - Color White. We want you to be totally satisfied with your order. Like new. Minor wear on the radio. Only thing I have used are the radio and the reel antenna. Only reason i'm selling it is because I have another radio. Original box and manuals and it appears everything it originally came with is included. Free shipping!! No returns and I only ship to US Addresses. UP FOR SALE IS A SANGEAN PT-633 PROTRAVEL AM/FM 9 bands world receiver stereo/sw1-7 LOOK. CHECK PICTURES FOR MORE INFORMATION. CHECK PICTURES FOR REFERENCE. As you can see from actual picture,( What you see Exactly what you get ). UP FOR SALE IS A Sangean AM/FM-RDS, iPod Dock, AUX-IN, Line-Out, Clock/Alarm, Remote, Dark: WR-5. CHECK PICTURES FOR MORE INFORMATION. CHECK PICTURES FOR REFERENCE. TESTED FOR KEY FUNCTIONS. With Phase Loop Lock Digital Tuning and Sangean's traditional radio sensitivity. Excellent Audio Sound & Reception. AM/FM Analog Band. This is for the radio only. I don't know anything about the operation of this radio. This lot features one Sangean CCRadio Plus. the radio works well. the only problem is that the turning knob on the treble is missing. The radio is an AM/FM/ Weather Band Receiver with Alerts for severe weather. Here is a working Sangean ATS 909 radio with case, manuals, earphones and antenna.The radio plays on MW and FM and has static on short and long wave. No batteries. Good condition overall. Due to age sold "AS IS". SANGEAN PR-D9W weather monitor, AM/FM Radio. A/C power supply included. Great condition. I do not believe this was turned on and off more than three times for a total of two hours. Moving. No longer need. Condition is New. Water resistant. Mfg by Zadro. Use 2 AAA batteries (not included) Item is new in the pkg but. UP FOR SALE IS A SANGEAN PT-10 PROTRAVEL AM/FM-STEREO/ LW / SW 1-9 WORLD RECEIVER LOOK. CHECK PICTURES FOR MORE INFORMATION. CHECK PICTURES FOR REFERENCE. As you can see from actual picture,( What you see Exactly what you get ). 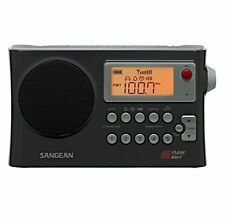 UP FOR SALE IS A Sangean U1 AM/FM-RBDS/Weather Alert/Bluetooth/Aux-in Ultra Rugged radio receiver. CHECK PICTURES FOR MORE INFORMATION. CHECK PICTURES FOR REFERENCE. As you can see from actual picture,( What you see Exactly what you get ). What you are buying: Sangean CCRadioPlus - AM/FM/TV/WX Radio - DX model - portable - battery powered (4 d-size batteries included), NO cord. Unsure if the light feature works. The Sangean ATS-803A put Sangean on the map in the world of shortwave radio. It follows on the success of the earlier ATS-803, but adds Wide-Narrow selectivity and an improved knob set. All works. AM/FM Weather Alert Portable Radio with Bandwidth Narrowing. 25 Presets (10 AM, 10 FM, 5 WX). Receives all 7 NOAA Weather Channel. AM/FM/Weather Alert Waterproof Shower Radio (White). Built-in AM antenna with pigtail antenna for FM/weather band. Great condition pre-owned waterproof radio. Photos clearly show condition, unsure if ever actually used. Radio Plus AM FM Weather Band Radio Receiver WA-01. Condition is Used. Shipped with USPS Priority Mail. Sangen PR-D5 FM-Stereo (RBDS)/AM Digital Tuning Portable Receiver (BLACK). Condition is New. Shipped with USPS Priority Mail. 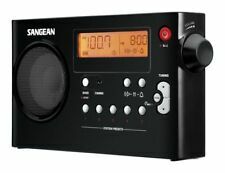 This is the Sangean Dynamo hank-crank or battery AM/FM Water resistant radio receiver. It is barely used. Works perfectly. Battery or wind up, your choice. Manufacturer: Sangean. Don't be misled by the compact size of the MMR-77. It has excellent reception and audio for its size. A convenient neck strap is included. Carrying strap included. PLL-Synthesized Tuner for excellent reception and Easy to Read Large Dial Scale with Smooth Rotary Tuning and Softly Lighted Analog Display. Sounds great, works fine, has a ding in left rear corner, see photo #3. For sale here fromSANGEAN is the S.A.M.E. 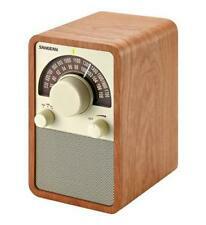 TABLE-TOP WEATHER HAZARD ALERT WITH AM/FM-RBDS ALARM CLOCK RADIO. Model CL-100. Lightly used, item is in excellent condition with no known faults. DeLuxe Table Top, AM/M Clock Radio. HD/ FM rod antenna. Information display for Channel frequency, call sign, radio text, Audio mode, service mode, signal quality. HDR-14 HD Features. Trending at $77.58eBay determines this price through a machine learned model of the product's sale prices within the last 90 days. Unlike other shower radios, most of which are just water resistant; the Sangean H201 is made with JIS7 standard, which is waterproof. It is so versatile that you can enjoy your radio programs while showering, take it on a fishing trip, take it to the beach, and never be afraid of water or sand damaging your radio. Tone is well balanced and excellent for both talk and music. The PR-D7 has excellent sensitivity and selectivity and will surprise you at its ability to pull in those distant stations. Five presets are available on each band and the auto seek will automatically seek the active stations across the entire band rather than to the next frequency. This is a USED battery cover. It is for a CCRadio. It is in used condition. This is for the battery cover as pictured only, there is no radio included. See pics for model, plug style, and condition. Welcome and thank you for your interest in this item. You are looking at a VINTAGE SANGEAN SG-796 MULTIBAND FM MW SW 1-7 CHANNELS PORTABLE RADIO. This item is in good working condition. It has cosmetic wear...scratches, nicks, bumps. There is some corrosion in the battery compartment. It will operate on 2 AA batteries (not included) or a 3 volt power supply. It has a headphone jack output. The radio measures about 6" x 3" x 1". It has a wrist strap and extendable antenna. I may have unintentionally failed to describe a blemish or defect. I am not a trained appraiser. By purchasing you are accepting my description as is. Please look at all photos as they are a very important part of my description. Trending at $28.87eBay determines this price through a machine learned model of the product's sale prices within the last 90 days. Its dynamic bass compensation will ensure rich clean sound anywhere. Sangean's WR-16 MDF Cabinet with a real Walnut finish not only makes for an elegant appearance, but improves sound quality due to its acoustically tuned design and properties. Tested and working. No major wear showing anyplace! Unit for sale is the one pictured. 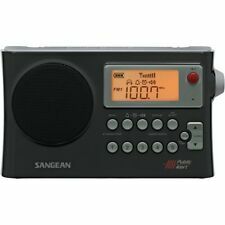 Sangean CC Radio Plus DX AM/FM/TV/Weatherband with Alerts Alarm Station Recall. Condition is Used. Shipped with USPS Priority Mail.